I learned something when I moved to Portland: Portlanders love to move stuff on their bikes! One summer my husband and I were invited to take part in a friend’s bike move (it was a total blast). I am not a professional cyclist ( Source ) and I had a fear of falling off my bike. Despite my hesitation, I went ahead but my little rack didn’t do much compared to the impressive cargo contraptions other people had. I mean, there was even a guy on a cargo tall bike who could carry way more than me. 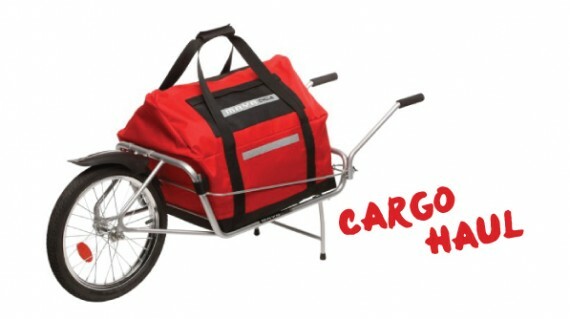 Cargo bikes are comfortable, handy and extremely affordable for all the convenience they offer. But if you’re not yet ready to invest in a cargo bike, or simply don’t have room for one, here are some simple ways to easily turn your commuter bike into a hauling machine. I’ve rounded up some of the best accessories to beef up your current bike’s cargo capacity and give you the freedom to haul (just about) whatever you need to haul. Special thanks to the PDX Cargo Bike Gang for their recommendations! Detachable bike trailers are a fantastic way to turn your everyday commuter bike into a cargo-hauling machine. Many of the companies listed below design trailers for kids, too, but I’ve just included a roundup of cargo-specific trailers here. THE BURLEY FLATBED can easily haul up to 100 pounds, with an open front and back for hauling long loads. It weighs in at 14.5 lbs, and folds away so you can store it easily. WIKE, THE WALK AND BIKE COMPANY, also makes a variety of sturdy trailers. They’re a bit heftier (the flatbed weighs 18 lbs, and doesn’t collapse), but have gotten good reviews. 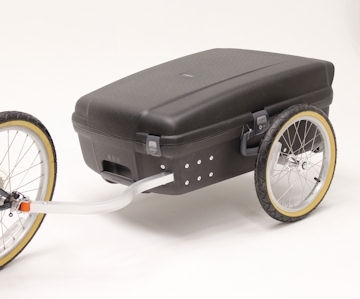 In addition to their open trailers, they also make a suitcase trailer (pictured) which would be amazingly useful for Bolt Bus trips with your bike. 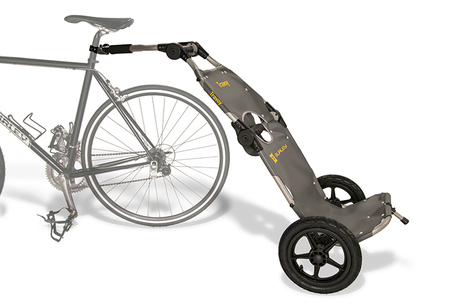 THE MAYA CYCLES BICYCLE TRAILER has a cool wheelbarrow-like design that makes it easy to carry cargo while off the bike, too. 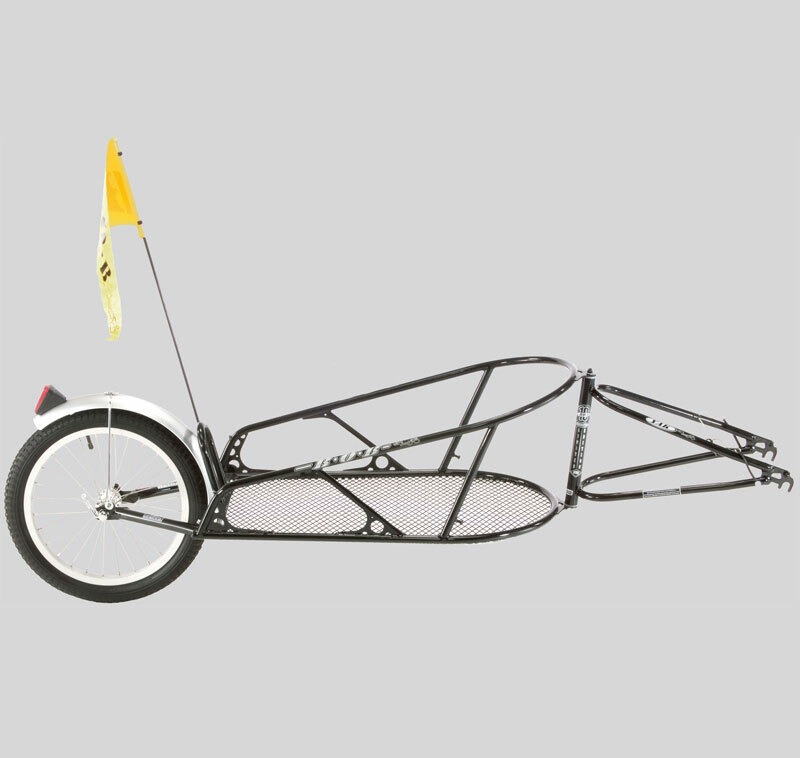 THE BOB YAK has a similar design, and gets great reviews. It’s a classic trailer that is light weight, tracks nicely and is sleeker than most others. This trailer is generally preferred among people who tour with a trailer. Due to the size, it’s not the best option for all around town hauling. If you’re not looking for a full-on bike trailer, there are a couple other light-duty options that can still help you carry your load. THE BURLEY TRAVOY is amazing! 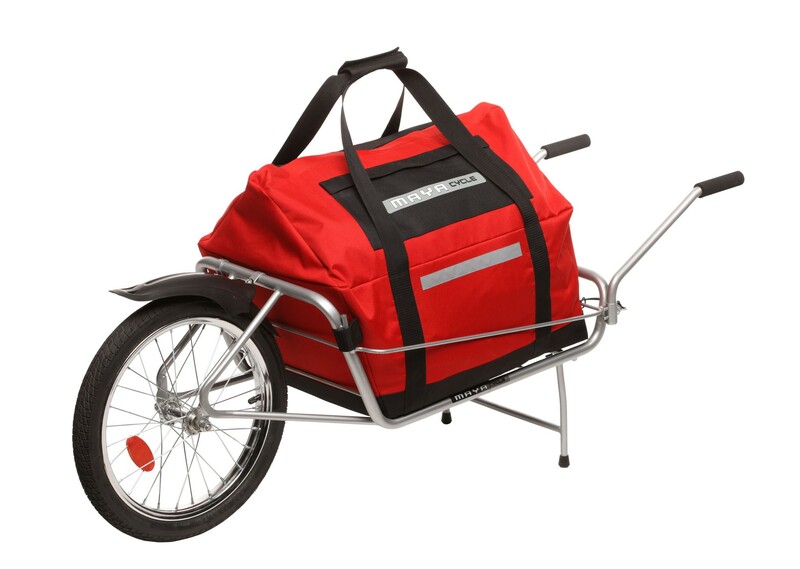 When not on the bike, it acts like a dolly to haul groceries or luggage (up to 60 lbs). It then attaches to the seatpost when you’re ready to roll. It’s very lightweight (less than 10 lbs), and folds up for easy storage. 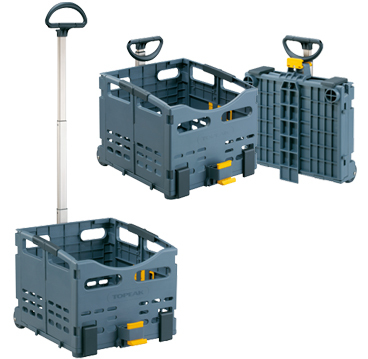 TOPEAK MAKES a TROLLEY TOTE that is carried on the bicycle’s rear rack. It can carry just under 20 lbs – making it great for light-duty shopping – and it has a telescoping handle for wheeling around the market. It also collapses for storage. How do You Fake Having a Cargo Bike? What’s your favorite way to carry cargo? Leave your recommendations in the comments below. Jessie Kwak is a writer who loves to type about the good life: travel, outdoor adventures, food and drink, and (of course) cycling. You can find her at Bictoro: Bikes and Crafts. I’d like a metrofiets too!